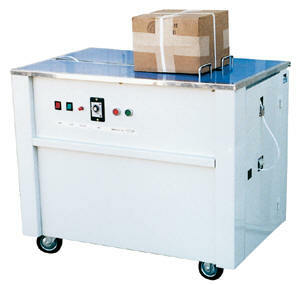 Fully portable table top strapping machines are used to tighten and seal poly-propylene strapping around products, packages, boxes, bundles of wood, parcels, and other supplies that needs to be held together more than 3" in diameter. Easy Rack offers small businesses that have some level of shipping or packaging needs an economical and durable low volume solution. Mass production and packaging companies like newspapers, magazines, shipping businesses almost certainly use automatic strapping machines. Commercial & industrial business application of strapping machines include magazine publishing, lumber companies, post offices, small distribution newspaper printing companies, food packaging plants, book publishers and general merchandize packaging. Easy Rack?s table top strapping machines automatically tensions strap and joins the ends with a secure heat weld. The motor automatically switches off when not in use. As the strap is inserted, the motor automatically restarts. Wall plug is standard 15V single phase 15 amp. 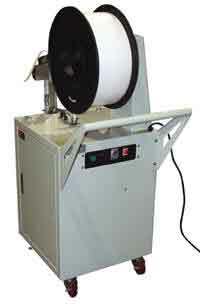 Strapping machine automatically feeds the desired polypropylene strap. Small companies that need pallets or skids strapped Easy Rack offers a semi-automatic probe strapping machine that eliminates hand strapping and speed up the process of pallet strapping with this semi-automatic pallet strapping equipment. Strapping unit automatically feeds the desired polypropylene strap through the pallet, tightens and seals the strap around the pallet. 115V power supply. (h) Remove machine and insert into next pallet. If you can not find what you are looking for call us toll free at 1-888-776-3720 and we will find it for you. Our home office is located in <?xml:namespace prefix = ns0 ns = "urn:schemas-microsoft-com:office:smarttags" />Houston, Texas with warehouses located throughout the United States that enable us to service all 50 states including New York NY, Los Angeles CA, Miami, FL. Chicago, IL. Denver CO., El Paso, Texas, Dallas TX, San Antonio, TX, Austin, TX, Boise ID, Atlanta GA, Albuquerque NM, Raleigh-Durham NC, Washington DC, Albuquerque NM, Huntsville AL, Fayetteville AR, Norfolk VA , Madison WI., Corpus Christi, TX, Plano, Texas, Garland, TX, Laredo, Texas, Lubbock, TX. Strapping machines! There are various pieces of strapping machinery that you should consider, and all have their rightful place in the whole process of readying product for dispatch. Using the correct strapping tools to tension and cut the material to the right size will allow for a much better and more resilient fit that will stay in place throughout the journey.